Hot Winter Fashion Ideas: Are you looking for some winter outfits for young school and college going girls? You would love reading this because Outfit Trends bring you some super cool winter fashion ideas for teens. Young girls absolutely love dressing up; they are always on the lookout for trendy clothing. Finding such pieces in Winters becomes a difficult job, however. In the extreme cold weather, you ought to pull out jumpers, sweaters, and jackets to protect yourself from the harsh weather. Winter wear can be super boring especially if you are on-the-go and need something new every day. One way to repeat any outfit is to style it in different ways. You can add in a scarf around the neck, over your jacket or woolen shirt. You can also go for a blazer to wear over a top, styling it with a statement necklace. You may add in any trendy piece of accessory to match with the outfit and give it a new appearance. It will completely change the look and make you seem more charming. We know how many girls love sneakers and how they can be worn with most outfits. You can also check out this great collection of Sneakers For Teenage Girls. 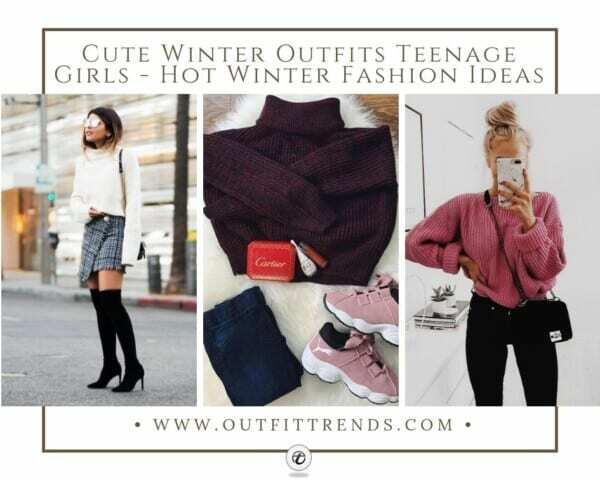 What Are Some Cute Winter Outfit Ideas For Teen Girls? Leather jackets and hoodies are most preferred in winters. There are available in a number of colors and styles. Jackets can be worn to cover but they also work as a style statement. Stay updated with the latest cuts and designs. Make sure to have matching makeup and hairstyles that go well with your outfit for a chic look. For example, if you are going for some funky outfits you need to have some cool funky hairstyle with it too. Check out our huge collection of latest funky hairstyles for teenage girls only. Woolen sweaters have been trending lately. Wear them with distressed jeans for a casual style. Cashmere Sweaters and Blazers are also a great choice for the Winter season. You can wear them with printed trousers or embellished jeans for a unique look. Nothing looks better than a printed or a knitted scarf. Use this opportunity to stock up on some of the latest styles. Another great option is to wear a blazer or leather jacket over a peplum top. You can get a lot of ideas on How to Style Peplum Tops in Winters. Build a strong Winter wardrobe with these super easy and cute Winter wear ideas. Stay confident, no matter what outfit you wear. Confidence will make you look a lot better than anything else. Here is a must-have for all girls in winters. Find yourself a comfortable knitted sweater, or better yet get your grandma to knit you one. Sweaters are great at helping you keep warm and can make any outfit look desirable. It can be matched with anything in your wardrobe but here we want you to look your best with blue denim jeans and a grey infinity scarf. Always remember that with heavy clothing in winters, you may end up looking chubby so to avoid that, always go for skinny jeans. Wear them with statement shoes as these classic uggs and add in a shoulder bag in matching tones. Some studs and a bracelet will look great with the look. Here is an outfit you could wear in the middle of the week when you feel like chilling out but still want to give out mod vibes to your fellow peers. A striped sweater in lighter hues looks pretty awesome when worn with black or blue jeans and a scarf and a pair of studs. A great idea would be to wear plimsols with this ensemble. Ah, the last day of the week when you feel tired of dressing up and want a laid back style. A hoodie with a grey beanie and sneakers in white seem like the perfect combination. Put on some eyeliner with this outfit to ward off the slumber look. Hand-knitted scarves look highly fashionable with almost any outfit. You can style them with a peplum or wear them over a sweater. You could also knit one for yourself in a matter of days or just grab one from the market. Long vintage cardigans look pretty awesome with lovely black tights and shearling brown wedge boots to match it with. When going out always prefer a high bun as it is easier to handle with all the clothes. Being sporty doesn’t mean that you can’t look good. Look at the following styling idea and get a noticeable fashion look. The color choice is up to you but going for greys and blacks is great because they are risk-free. Pair a white tank top with a hoodie and a scarf with uggs. You can go with plain sneakers but uggs add the extra edge needed with the outfit. Here is a great girly winter color combination you could wear this season. Leave the bold and vibrant colors to wear in Summer! A great way to put together a cute look is to style any of your winter wardrobe staples. Not only do they look great but also give you an opportunity to re-wear some old pieces. With the holiday season closeby, you can go for Christmas style leggings with an oversized sweater. You can also wear it with a sweatshirt to get the schoolgirl vibe right. We absolutely adore this subtle combination and cannot wait to try it on ourselves. To give the outfit a much-needed glam, you can add in a pink scarf and a pair of silver or grey studs. For the shoes, we would recommend some ugg boots to keep your feet warm and to give the outfit a fun twist. Who says that you cannot show skin in winters? Look ultra trendy in this off-the-shoulder cardigan matched beautifully with turned up denim and a pair of animal print ballerina pumps. Balance the whole look with a green knit scarf and a pair of sunglasses. Chunky earrings or a nice wristwatch is the only other accessory required. With Fall and Winter so closely situated, here are some pieces you must include in your Winter wardrobe. A creme color sweater can work well with almost any color. You can create a neutral look or add in a bright colored pant for a fun, youthful appearance. We love how well the sweater complements the burgundy pants. The two can be put together for a casual look on a day out with friends or to the college. A great way to enhance the look is to match some accessories with it. Go for dull dark nail color and a funky ring. You can also add in a sling bag or a tote to keep it comfortable and chic. Here is a geeky look perfect for teenage girls. A Denim bleached jacket, with a loose fit, gives a retro look. Denim pieces can be worn all through the year without it looking boring or out-of-season. With so many varieties available, we would recommend a distressed or embellished jacket to make the perfect style statement. Wear it over a grey sweater shirt and black leggings to get the winter look right. We love how up-to-date and youthful this outfit is, perfect for any casual setting. Complete the look with a pair of Jordan sneakers and some cool eyewear. We simply cannot get enough of this tasteful and elegant style. Young girls tend to undermine the power of the color pink and usually skip it for other shades. However, this outfit makes us want to fill our wardrobe with some pink shirts and sweaters. Here is how to style yours! Pair a basic black pant with a girly sweater shirt like this for a smart look. For the accessories, a pastel bag, and some gold jewels will give you the much-needed shine. Wear it with a pair of edgy and cool boots or add in the ugg boots for a cute and youthful appearance. Get in the ultimate Winter Wonderland spirit by picking out some classic pieces. This outfit sure is tasteful and will win the hearts of many. There are so many things to love about it. The color combination, the long Tory Burch boots, and the classic accessories look wonderful together. This look could make for a great travel look to the Aspens. Puffer jackets are anyway a hot trend. They look great with almost every outfit but this specific emerald green vest is a must-have for every teen girl. Here is a great back-to-school look you could wear in Winter or Spring. While we acknowledge that dressing up in the mornings is not a piece of cake, it sure isn’t that bad either. Go the easy way by putting together a nice pair of jeans with a sweater to keep it cool and comfortable. You can choose a colorful, bright sweater or go for a dull yet beautiful one. You may also add in some color with a printed, vibrant scarf. For shoes, you can go for some cool sneakers, espadrilles or a pair of boots for the ultimate Winter style. A knitted scarf is a quintessential winter accessory to stock up on before the season even kicks in. Why do we recommend it? Simple. Scarfs can help accessorize almost any outfit. You can wear them over an oversized sweater or even a classy winter dress. Day or night, these scarfs help you stay cozy and warm. Here is a great example of what a woolen scarf can do to your outfit. Without it, this outfit would have been dull and boring. The addition of a simple white scarf just took it to another level. Tired of dealing with oily Winter hair? Here is a great solution. Give your hair the much-needed break from excessive shampooing. Tie them up in a bun to give yourself a sleek and smart look. A top-knot goes well with Winter attires and can help add a bit of height to your figure. Try out different styles like a reverse braid, messy bun or add in some cute hair accessories for a funky look. For the makeup, warm tones are just what you need. Pick out browns from your Urban Decay Naked palettes and smear some on the eye’s crease to add some shadow. A bit of highlight on the corners would instantly brighten up your look. Here is a perfectly chic outfit to wear when it is snowing outside. Sophistication is the key and so, we love this minimalistic style. Keep yourself comfortable warm while looking effortless and cute. Everything about this outfit makes us want to hit the racks immediately! Each piece has been picked to match the combination and looks great when put together. Everyone has a basic pair of black jeans lying in their wardrobes. Get a hold of it and style it with a long woolen sweater shirt. For the accessories, you can throw in some classic Raybans and a grey beanie. Channel out your inner fashionista with this glamorous and edgy style. While most people opt for pastel tones during Winter, you can break the norms and go for an all-black look with a slight pop of color. Here is another great way to put your black jeans to use. This super cool sweater can be worn while out with friends or when building snowmen. The outfit has all the C’s: Classy, comfortable and chic. That’s not all! Here is what more to add. A basic black outfit sure needs a bit of oomph! Add in some edgy, lace-up boots. Keep your eyeglasses in check to beat the Winter sun. A classy, gold watch can never let you down. Add in a scarf around the neck to keep it warm. Lastly, a nice, light-colored bag would be great at toning down the look a bit. We bet you would want to hit the stores after looking at this effortlessly chic outfit idea. We have talked about the different sweater styles but here is one that remains a forever classic. A turtle or a high-neck sweater is a must-have for every girl whether young or old. It is a staple winter clothing you must own. We absolutely adore this plum-like sweater that has been paired with denim jeans. Wear it with sneakers, or a pair of joggers to look simple and minimalistic. For this attire, we would recommend pulling your hair in a loose bun to highlight your face. This classy and trendy outfit is just what you need for your next coffee date.